More homeowners are installing the frequently-lampooned beds, rather than renovating or moving to a bigger home. The beds, which swing up into a wall for vertical storage, help home offices serve as bedrooms and vice versa. 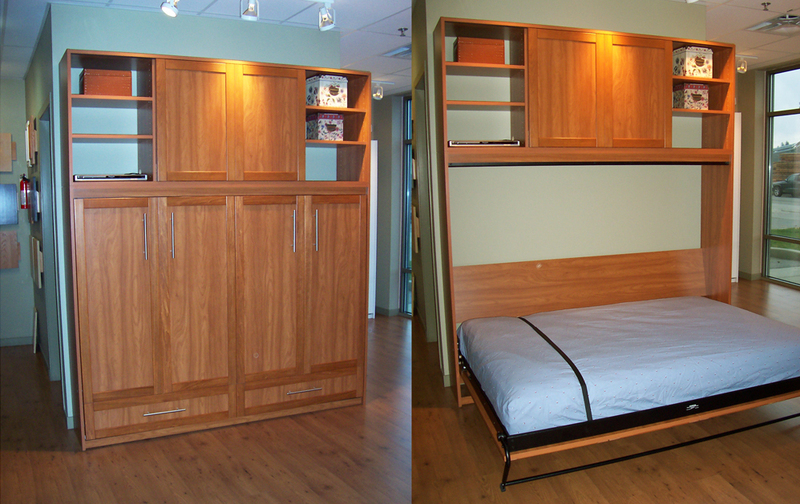 Murphy beds have come a long way from their rickety roots. Most of the new iterations can hold a regular mattress in any size—from twin to a California king—making them more comfortable than the foldable pads found in many sofa beds. Ranging in price from several hundred dollars to tens of thousands for more elaborate designs, the new Murphy beds blend more effectively with their surroundings. The old wood-paneled exteriors have been replaced with expensive cabinetry, the facade of an armoire or even a flat-screen television. The growing interest in Murphy beds comes as Americans are building smaller homes and making fewer changes to their existing houses. The size of the average new single-family home in 2010 was about 2,400 square feet, down about 5% from 2007, according to the U.S. Census. Remodeling activity is down so far this year, continuing a trend of about the past five years, according to data from the National Association of Home Builders. “People have invested in staying in the homes that they’re in,” says Ginny Snook Scott, vice president of sales and marketing for California Closets, the home-organization chain that is a unit of FirstService Corp. Online inquiries for wall beds have doubled in the past 18 months, she says. Converting a bedroom into a home office is a common adaptation among people who work from home. Last year, 1 in 4 employed people did some or all of their work from home, up from 1 in 5 in 2007, according to the Bureau of Labor Statistics. William Murphy came up with the wall-bed concept at the turn of the 20th century, according to Matthew Lahn, general manager of Murphy Bed Co., which calls itself the “original Murphy Bed Company,” although any manufacturer can use the name Murphy bed. Mr. Murphy was looking for a socially acceptable way to have a woman visit his studio apartment, Mr. Lahn says. The concept was a hit with hotels and quickly became a slapstick comedy staple for the likes of Charlie Chaplin, Mickey Mouse and Abbott and Costello. Murphy Bed Co., in Farmingdale, N.Y., ships several thousand beds a year, Mr. Lahn says. “They’re becoming much more prevalent in private residences,” he says. Some recent installations the company has done include Murphy beds in a home gym and a Hamptons boathouse, he says. Shamaya Gilo has a Murphy bed in an alcove adjacent to the living room of her Manhattan penthouse to accommodate guests and visits by her grown daughter. “Blowing up an air mattress takes twice as long as pulling out a Murphy bed and converting it into a bedroom,” Ms. Gilo says. Ron McKey, owner of FlyingBeds, a Denver manufacturer, says the newer versions of Murphy beds have improved lifting-and-lowering mechanisms, which mean a high-quality mattress can be lifted with the same effort required for a thin futon. Hardware improvements also enable owners to create more elaborate disguises for the bed in its upright position, without worrying about weight. Mr. McKey says he has mounted fully functioning flat-screen television sets on the outside of his wall beds. He has also covered the outside with a large, heavy mirror. “I’m big on deception,” he says. Pat Splinter, in Granite Bay, Calif., says she had two wall beds installed in her large bedroom for her grandchildren to use while staying with her on weekends. Although she has spare bedrooms in her home, Ms. Splinter wanted the children closer to her and her husband at night. “I can’t stick them way on the other side of the house. They’re too young, and I’m too lazy,” she says.